Centaurus A is an active galaxy, meaning it gives off extraordinary amounts of radiation, most likely the result of a supermassive black hole. Somewhere inside these gas clouds and dust lanes, that black hole is creating unimaginable cosmic chaos. 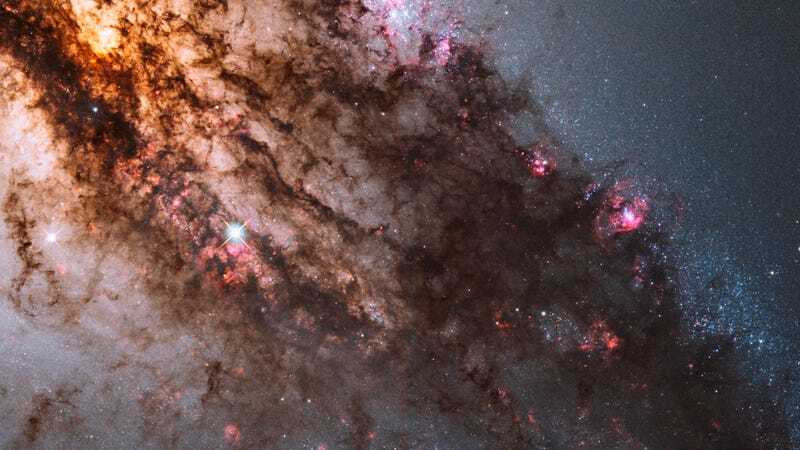 This Hubble image shows off the central region of Centaurus A, which is a mix of red glowing gas, dark clumps of dust, and lots of bright blue star clusters. This particular image has been processed to appear in its natural colors, meaning this is basically how the galaxy would look to the human eye. Viewing it that way, however, obscures the presence of the supermassive black hole that is constantly showering this region in radiation. Infrared images from the Hubble have also shown that hidden at the center of this activity are what seem to be disks of matter spiraling into a black hole with a billion times the mass of the Sun. Centaurus A itself is apparently the result of a collision of two galaxies and the left over debris is steadily being consumed by the black hole. Astronomers believe that such black hole central engines generate the radio, X-ray, and gamma-ray energy radiated by Centaurus A and other active galaxies. But for an active galaxy Centaurus A is close, a mere 10 million light-years away, and is a relatively convenient laboratory for exploring these powerful sources of energy.